The Society says the Corps misses the mark on the "real causes of salmon decline for which they bear primary responsibility." The Audubon Society of Portland last week announced its intent to sue the U.S. Army Corps of Engineers to prevent it from putting a plan in place to reduce the population of double-crested cormorants at East Sand Island in the lower Columbia River estuary. "Rather than addressing the primary cause of salmon decline, the manner in which the Corps operates the Columbia River Hydropower System, the Corps has instead decided to scapegoat wild birds and pursue a slaughter of historic proportions," said Bob Sallinger, Audubon Society of Portland's conservation director. 'Sadly this will do little or nothing to protect wild salmon, but it will put double-crested cormorant populations in real jeopardy." He said that of the more than 150,000 comments the Corps received, 145,000 of the comments were in opposition to the Corps' plan to "move forward with the wanton slaughter of thousands of protected birds." According to the Corps, "NOAA Fisheries' 2014 Supplemental Federal Columbia River Power System Biological Opinion calls for a reduction in double-crested cormorant predation of juvenile salmonids over 172 river miles of the Columbia River estuary by reducing the East Sand Island colony, which accounts for 98 percent of the double-crested cormorant breeding population in the estuary." The Corps' preferred alternative (C-1) in its EIS is to reduce the cormorant population at East Sand Island by two lethal methods: shooting and egg oiling, which suffocates the growing embryo inside the egg shell. The Audubon Society of Portland, which has 15,000 members from throughout Oregon, says the reduction in the double-crested cormorant population that is proposed in the Corps' plan would amount to 15 percent of the entire West Coast population of the bird, which ranges north to British Columbia, south to the U.S.-Mexican border, and east to the Rocky Mountains. The current population is an "order of magnitude smaller" than a century ago, the Society said in comments sent to the Corps March 11 (audubonportland.org/files/habitat/cormorant-feis), and a resurgence of the population has only occurred on East Sand Island. The island is also known for being home to the largest colony of Caspian terns in the world and the largest brown pelican post-breeding roost on the West Coast. While the Audubon Society says it supports salmon recovery in the Columbia River, it supports only "science-based strategies that address the primary causes of decline, not the persecution of fish-eating birds for simply doing what comes naturally." The Corps should first stick to its primary responsibilities of making the federal hydroelectric system safe for salmon, the Society said. It calls on the Corps to focus on management of the federal hydropower system, habitat loss and hatchery fish as the real causes of salmon decline "rather than scapegoating wild birds." The Society says it prefers the no action alternative listed in the Corps' EIS, not the C-1 alternative chosen by the Corps that calls for a reduction of the cormorant population by shooting birds and oiling eggs. The reduction proposed by the Corps would be 10,912 individuals and 26,096 total nests to be taken in all years, a lower proposal than the draft EIS' alternative C, which proposed to reduce the population by more than 18,000. However, that alternative proposed less than alternative C-1 with nesting birds and their eggs. Among its comments, the Society said the cormorant plan is inconsistent with the Migratory Bird Act and will threaten the western double-crested cormorant population because the numbers, even by the Corps' calculations, will fall below a sustainable level for at least four years. The Society urges the U.S. Fish & Wildlife Service not to issue the depredation permit that will be required for the Corps to proceed with its plan. The anticipated depredation permit application will not address the taking of non-target species, such as the very similar looking Brandts and pelagic cormorants. The Corps did not consider all alternatives, including relocation and flow management. The Corps did not adequately explore non-lethal dispersal alternatives. The Corps failed to outline the details of how USDA Wildlife Services will implement the two lethal methods to reduce the cormorant population. The Corps failed to show a plan for situations involving lethal control of adults with active nests that have young when the parents are culled over the water. The Corps failed to address the potential impacts of nesting brown pelicans. 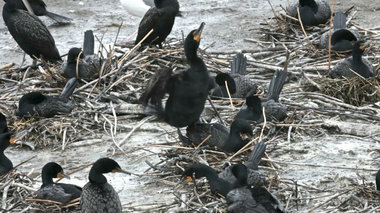 The assertion that other cormorant populations outside the Columbia River are stable is unsupported. Reducing the number of cormorants could result in an increase in predatory fish, such as pike minnow. "Alternative C-1 provides little confidence that the projected benefits to listed salmonid species would be realized, but raises serious concerns that the survival of the populations of cormorants west of the Rocky Mountains would be placed in jeopardy," the Society concludes.